Welcome to the 39th issue of the Community Crunch! To those unaware this is a topic which primarily consist of content to share, made by the community, for the community! As well as any little changes I want to make survivors aware about, which happen within our community ;). Introducing everyone’s favourite Community Mod Liaison, Complexminded! Hey there Complex! Welcome back to the Community Crunch, it’s been awhile since we last featured you on here and a lot has changed since then. Mind giving our readers a catch up on what’s happened since we first featured you and Primitive+? Hey Jat! Lot's has happened since the last time we chatted. Shortly after entering the contest, that crazy thing we call life happened. I had a lot going on personally and at my job which took me away from Primitive+ and the community. While there are some things I know I should have done differently, thank you for all those who hung around. I think anyone who followed the mod before knows that I am very active and dedicated to the idea I'm trying to convey. Winning the contest was unbelievable! There was a lot of good content and I'll be completely honest, I didn't think I would win. I really didn't. Actually I wouldn't have found out I won for a while. A co-worker was following the contest and asked me if I heard anything. It wasn't a few days later until they said "look in your spam folder", and there it was! I'd like to thank everyone who supported and now I get to support the next winner! I always had plans to continue after the contest and had the idea and mod in the workshop before the contest was an idea. During the reboot of the mod outage I starting talking to Studio Wildcard about a position for the mod community and here I am! I'm excited to be a part of what's going on here at Wildcard and I can't wait to continue working on Primitive Plus. The goal at the moment is to get it to a "stable" state before introducing some of the content that was planned originally. It has been quite the ride, congratulations once again on winning the competition and welcome to Studio Wildcard! Now as the Community Mod Liaison, what can the ARK community expect to see from you? It's a constant iteration as the team adds more content into vanilla ARK, I will look to find primitive alternatives for accomplishing the same thing. It will continue to grow even as official content winds down. Recently, I launched a "unrestricted" version in hopes of letting people customize their engram experience to the fullest. This will eventually allow them to make their own primitive lifestyle. My hope is that the following and support for the mod grows which will allow me to make it the best primitive experience ever! I'm also a fan of modding so I visit the workshop looking for new mods all the time! I'll be spotlighting things and talking with various mod authors because, let's be honest, I can learn too! I'm inspired by a lot of things I see and I love finding out the inspiration for some of the mods I see, particularly maps. Ideally, I'm hear to be the voice, so it's about what the community wants. Primitive+ has grown a lot since it first started. For those survivors who haven’t heard of it - mind letting us know what it is and how it’s progressed? Everyone keep in mind that this mod isn't based in a medieval era or a specific technology age. 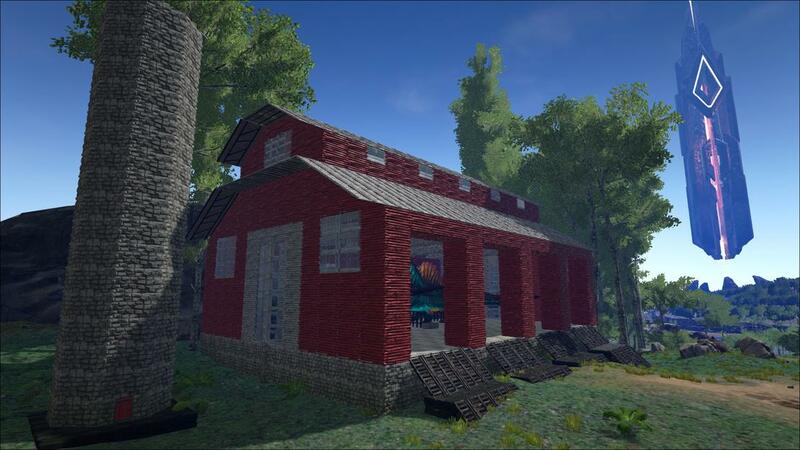 The mods premise looks at what would be possible with present day knowledge and the resources that ARK provides. What would be possible? I've done tons of research and you'd be amazed how things like electric can be made with primitive resources. I started this mod looking for a more immersive experience. While in some ways it may feel more "grindy" than a traditional experience, it doesn't feel "grindy" because it adds to the immersion of the character you are playing. This mod is naturally suited for role-playing servers but works with anyone looking for a more realistic experience. There are over 100 custom items, resources, and objects for you to explore! Before I add anything I do a considerable amount of research and think how it adds value to the mod and if it would be realistic. Primitive+ is very similar to primitive in terms of weapons and tiers of material, except there are guns. It's aimed to create an economy and a trade system by using specializations. Every additional resource or object I added relies on another "specialization" offered in the mod. It's why separating the mod or making it stack with other mods is a challenge. You will find in Primitive+ that original ARK items have different art, names, or just work differently than you would expect. I'm constantly tinkering and re-thinking things based off the feedback I'm getting. Recently, we launched some official servers for Primitive+. That means you WILL be able to find me on official servers playing and getting feedback in person. My first time loading into the official server I announced myself and got punched in the face I'll take that feedback too!! I have a lot of things in store for the future of Primitive+ (wagons, electric, more meals/seeds, lights, etc). More importantly, the fans know that a lot of these ideas came from them! Keep submitting your experiences! Excellent! Cannot wait to see the progression of the mod, I know there are a lot of players already keen on playing - got a lot of angry tweets when we were slow with the redeployment of those servers! Very passionate, haha. Is there anything you’d like to wrap up with? milokamilo’s Many New Items Mod! The ARKitect for Community Crunch 39 is..
Congratulations! Very awesome looking base! 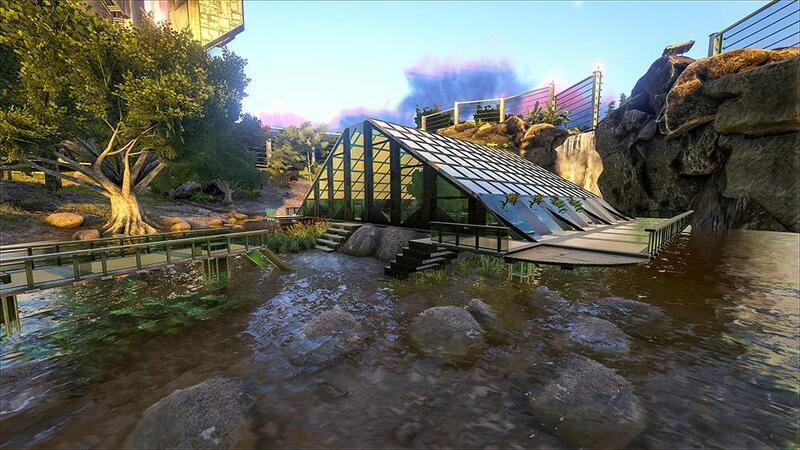 We'd also like to give an honourable mention to the following Survivors for epic arkitecture work! Valoule’s Lego ARK Police Station! A lot of seriously fantastic entries this week, it was very difficult to choose! Congratulations to all our winners . This is an award given to survivors who have created beautiful work of art for that week! As always, the artwork is not being judged on the quality of the screenshot or the graphical settings used, but instead what you have managed to draw and produce in game. We'd also like to give an honourable mention to the following Survivor for their ARKArt! Hey there! Thanks for joining us. Could you introduce yourself to the community and let us know about the mods you're working on? Hi I am iSpeZz. I have been married for going on 3 years to the love of my life. I am a stay at home Dad of 2. My Daughter is 2 and my Son is 1, so they keep me busy. I love working on my mods and it's always a work in progress. I live in the New Jersey area here in the US. You’ve got quite a few mods! Could you tell us a little more about them? 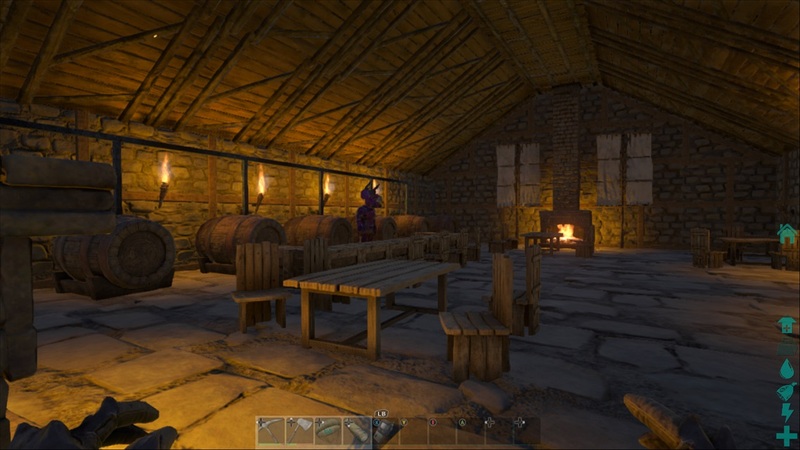 My Primary Mod is Ark Advance, which contains unique construction items and utility structures that add additional features to the game. Ark Advance Level 150 Dinos, which gives you max wild dino level 150 to hunt and tame. Ark Advance Supply drops which changes the items that can be found in air drops, ocean drops, and cave drops. Ark Advance Christmas - Tis' The Season which added christmas items such as music box, presents, christmas trees, wreath and lights. Where did you get the idea for ARK Advance? Initially I got the main idea for this mod when some friends started having issues with a mod like it, when it stop being supported, this way I could work on it if something happens with it after that, i continued to explain on it and adding my own ideas, Since then a number of other mods have been integrated into my own as well. I have to give special thanks to all the other mod devs that have given me the permissions to their mods and copies files (ElectroSkelington, DoctorDiscord and Harakys). Awesome to hear the Community working with each other to create larger mods and it’s very cool to see you resurrecting an old mod! ARK Advance adds quite a large number of items to the ARK. Were these created by you? How do you know what to work on next and what's your creative process like before bringing those into the game? Some of the items were created by me and others were incorporated from other mods who's developers no longer wanted to continue supporting their mods. Those items were used with the developers permission. Besides expanding on my existing item sets, I prioritize ideas that are suggested by the subscribers of my mod and my testing team. What are the long term plans for ARK Advance and do you think you’ll continue to update it? My long term plans are completing the sets that are currently in the mod, and expanding the steam powered set that are new to the mod. As far as the mod reaching a point that it has a lot in it, i'm close to the point and will be branching out into additional stand alone mods. Oh, cannot wait to see the complete steam powered set! Tell us more about your experience with modding. How are you finding the process so far? How are you finding working with the ARK Dev kit? I have been involved in developing mods for other games for about 3 years. At first it was difficult for me, but overtime the updates to the Dev Kit have made it easier to use and allowed me to be more creative. When I come up with an idea i can find way to accomplish them most of the time. Some members of the mod dev community have been really helpful in tackling some of the bigger hurdles, exchanging tips and ideas. Do you have any tips for upcoming modders on what they can do when working with UE4 and ARK itself? First of all don't be intimidated with the dev kit, dig right in! Many features are not obvious so spend time exploring. There are many Mod Devs willing to help if you have questions. Always good to hear how welcoming you guys are, Complexminded will have a lot of friends to work with! Is there anything you’d like to end with before wrapping this up? I would like to give thanks to all my Subscribers, Testing team, Mod devs that have helped me and Special thanks to Bella and Sayya for all the hard work they done and that last few weeks. Awesome! Thanks again for doing this spotlight and best of luck with ARK Advance!